In Bogotá, art is everywhere. Its streets are some of the most heavily ‘bombed’ in Latin America. The local street art collectives are relentless—even acrobatic—with their work. 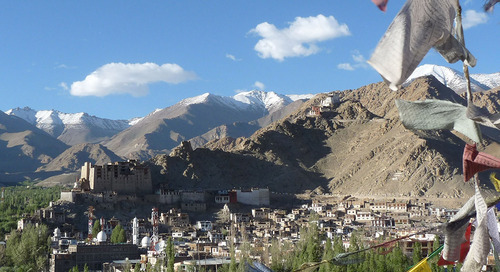 Stroll through any of the city’s neighborhoods and almost every surface is covered. While the country is working hard to prove to the world that it’s changed, Bogotá’s street artists are taking hold of their aerosols and covering up Colombia’s long-tarnished reputation with a divergent body of work that’s attracting widespread international acclaim. Colombian street artists like Carlos Trilleras and Rodez are demonstrating the power of graffiti and its ability to create dialogue and challenge the status quo. Dabuten Tronko’s murals often feature strong characterizations of women. Thanks to a decree signed by Bogotá Mayor Gustavo Petro in 2012, graffiti in Bogotá has been decriminalized. Today, street art is prohibited, though it’s not illegal. Works created on private property are permitted with the consent of property owners; elsewhere, graffiti can result in a fine, but not jail time. As a result, there is a lot of outdoor artwork to see in Bogotá—some estimate over 6,000 murals adorn its streets and laneways. But it wasn’t always this way. 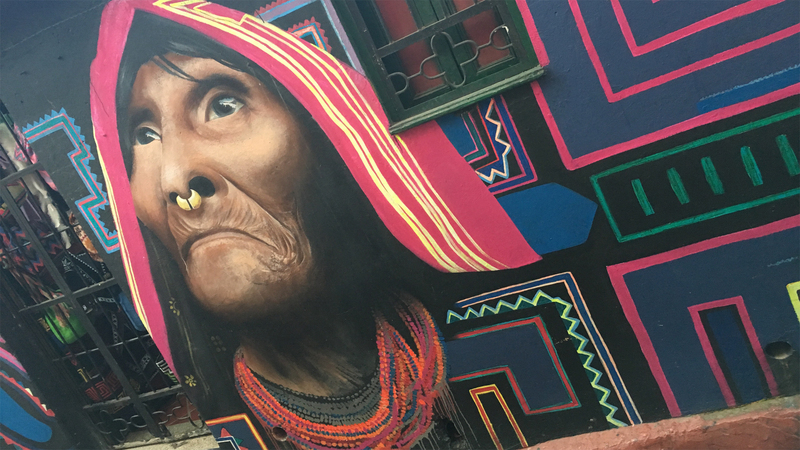 A portrait of an indigenous Cuna woman by Bogotá street artist Carlos Trilleras located on the narrow laneway of Calle del Embudo, near Plaza del Chorro de Quevedo. Bogotá’s street artists used to have to ply their art under cover of night, ready to bolt at the first sign of police, who were known for harassment and shakedowns. This changed, however, when a young street artist, Diego Felipe Becerra, was shot dead by police while painting his signature—a wide-eyed Felix the Cat. 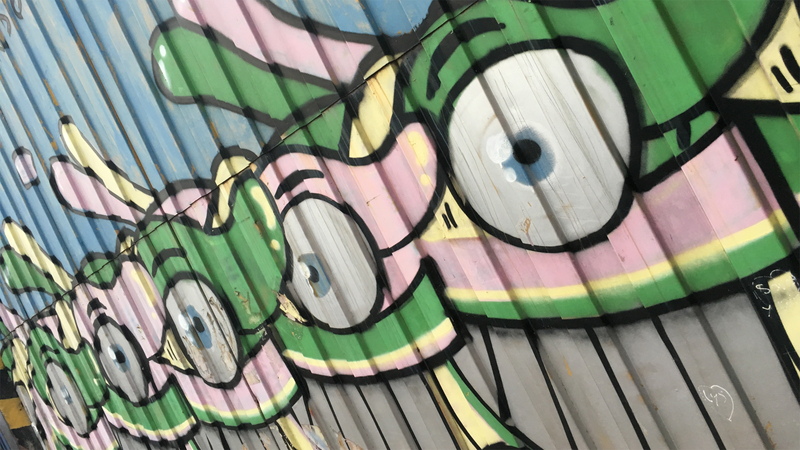 Police portrayed Becerra as a suspected armed robber, but public outcry over his death, along with condemnation from the UN and protests from artists across the country, sparked a wave of change for graffiti and street art and how it was viewed in Bogotá. A mural by Spanish street artist Pez. The Barcelona native has resettled in Bogotá. One of the best ways to understand the art and artists of Colombia’s capital is with a Bogotá Graffiti Tour. To promote Bogotá’s artists to an international audience and help visitors understand their messages, Australian street artist Christian Peterson co-founded the two-hour tour in 2011. Today, tour guides—many of whom are street artists themselves—provide context for the art and its practice, including the techniques, materials, socio-political messages, and the collectives which operate around Colombia. Colombian-born artist Rodez’s surreal creations are often creatures with multiple eyes, which he dubs animales fantastic. 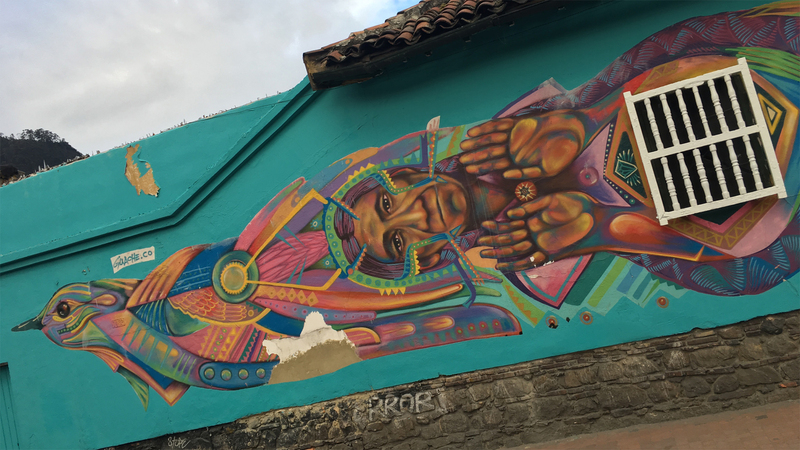 If your time in Bogotá is tight, it’s best spent wandering the narrow alleyways of La Candelaria—especially around Plaza Chorro de Quevedo—where you’ll find some of the city’s most notable street murals. 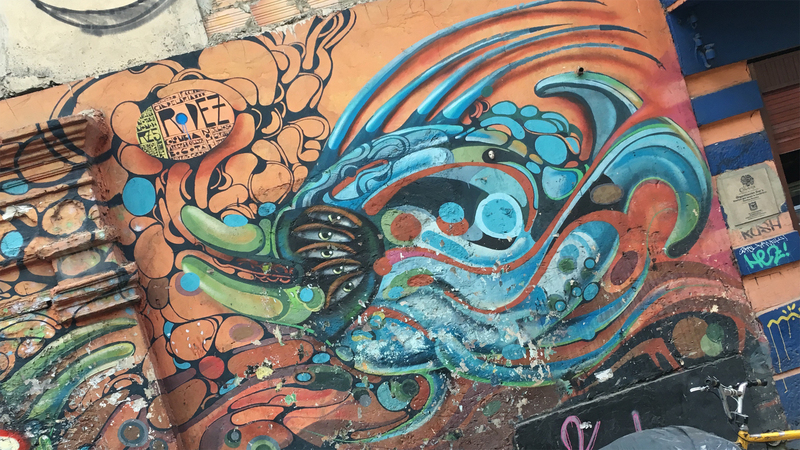 It might seem a bit incongruous that the city’s oldest neighbourhood serves as canvas to its newest art form, but it certainly demonstrates the appreciation and acceptance of street art in the Colombian capital. Guache’s artwork mixes styles of Latin America’s traditional muralism with graffiti and street art. Today, Bogotá is fast becoming something of an international mecca for street artists. Its liberal attitudes toward street art continue to attract some of the world's top talent, who join their Colombian brethren in taking their art to the street — not knowing how long these labours of love will survive in Bogotá’s ever-evolving political cityscape. 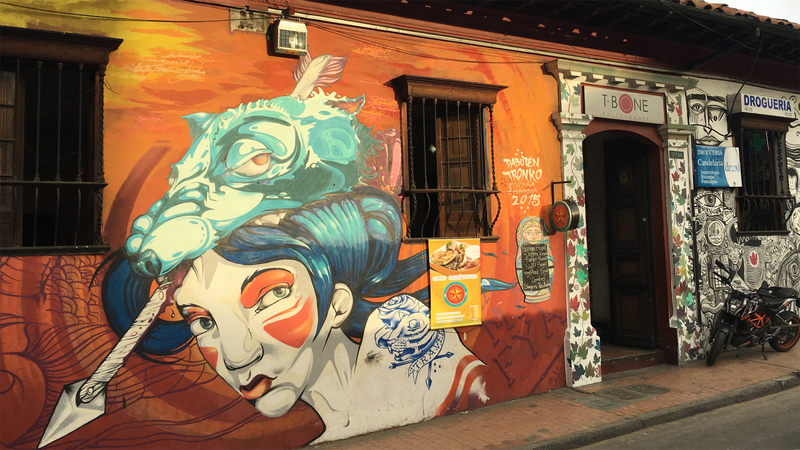 Want to experience Bogotá’s street art scene? 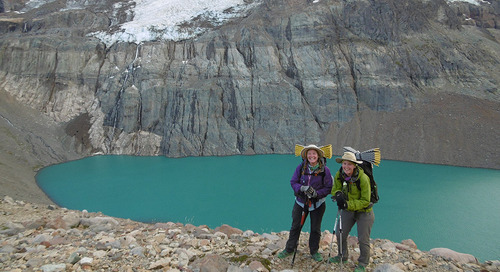 G Adventures runs a number of departures to Colombia, encompassing a wide range of departure dates. We’re thrilled at the prospect of showing you this big blue planet of ours — check out our small group trips here. Guidebook author and veteran traveller Mark Elliott knows just what Ladakhis do to keep balanced.